Weather HD and Weather Station Pro have very similar aims—to turn your iPad into a simple virtual “weather station” that tells you the basics about current and future weather conditions in any locations you choose, and to do it in a visually elegant fashion. Each succeeds in its own style—and if you decide to shell out a buck or two for either one of these neat pieces of weather eye candy, you probably won’t be disappointed. 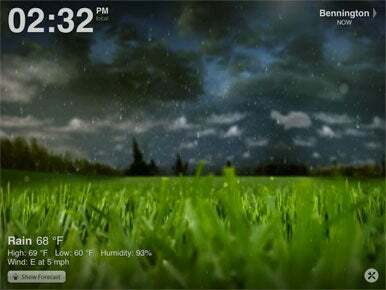 View on the Weather: Weather HD’s visuals are stunning, and its weather information is solid. Here it displays current conditions along with the day’s forecast high and low. But be sure to check the screen shots provided for each product in the App Store before you decide which to buy. Each of these apps is easy to use, requiring you to input only the places you want forecasts for (besides your current location). Weather HD has an extra screen of display settings (Fahrenheit or centigrade, clock on or off, font size), while Weather Station Pro enables you to switch between metric and imperial measurements with a tap of the main temperature or wind-speed displays. Both Vimov, the developer of Weather HD, and Toopia, which makes Weather Station Pro, get their data from Weather Underground, which has all kinds of detailed weather information and an iPhone-specific Website of its own. How’s The Weather: Weather Station Pro displays the current weather conditions for London and a five-day forecast. At left, a scrollable menu lists other cities that have been entered into the app’s one settings screen. If such details don’t matter much to you, the competition pretty much comes down to a straightforward beauty contest, with Weather Station Pro playing Mary Ann to Weather HD’s Ginger. In other words, Weather Station Pro is mighty easy on the eyes, and your parents will approve. Weather HD provides an array of short and stunning video loops that put you in the cockpit, six-miles high and surrounded by the clouds or snow or rain or sunshine described prosaically elsewhere on the screen. It’s the knockout app you’ll want to show off to all of your friends. This article was updated on September 25 to correct where Weather HD gets its weather information from. This correction did not affect the app’s rating.